Pulmonary function tests (also called PFTs or breathing tests) evaluate how well your lungs work. They help determine how much air your lungs can hold, how quickly you can move air in and out of your lungs, how deep of a breath you can take, and how well oxygen diffuses in and out of your lungs. They provide your physician needed information to help diagnose, measure the severity of lung problems, recommend treatments, and follow your progress. It is important not to do anything that might disturb your lung function before your test. Stop using inhalers, breathing treatments and sedatives for at least 4 hours prior to your test. You will be asked to sit inside a clear plexiglass booth, called plethysmograph. The airtight booth measures small changes in pressure that occur as you breathe. You will wear a nose clip to make sure that no air passes in or out of your nose during the test and you will be asked to breathe into a mouthpiece. PFTs are conducted by a specially trained respiratory therapist who will tell you how to best breathe throughout the test. The exact procedure is different for each type of test. Some of the tests are performed more than once to assure consistent results, while others may be repeated after you have inhaled a spray containing medication that expands the airways in your lungs, called a bronchodilator. The accuracy of the tests depends on your ability to follow the therapist’s instructions. The risk of injury from a PFT is very low. 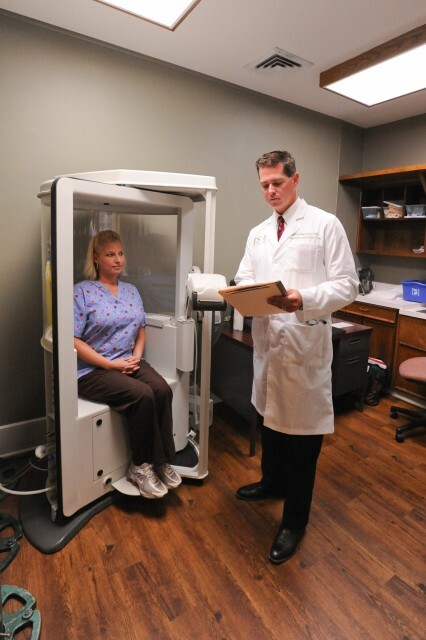 You will be monitored by a respiratory therapist, who will be seated less than five feet from you at all times. If claustrophobia is a significant problem for you, an alternative technique may be used to perform the testing. You may, however, experience some mild and temporary shortness of breath, dizziness or lightheadedness. If you feel any chest pain or discomfort, tell the therapist immediately.